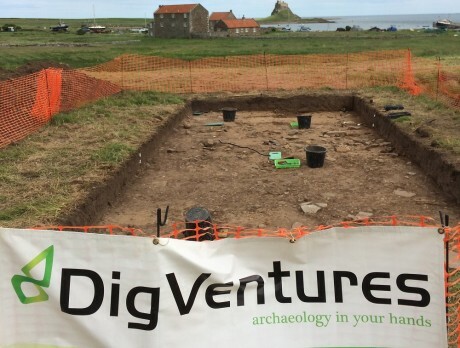 The Venturers have uncovered part of a building on Lindisfarne, made of what we’re dubbing ‘Anglo-Saxon concrete’. 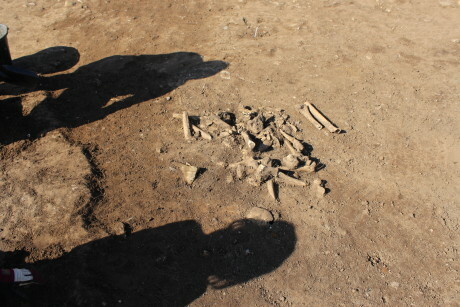 It’s pretty tough stuff, so could it be the remains of another early church? Roman concrete recently hit the headlines when archaeologists finally cracked the puzzle of why it still stands strong at least a thousand years after the last centurion died, while modern versions can crumble within a few decades. It’s all down to the mix, which got us thinking about the Anglo-Saxon construction materials we’re now encountering in our excavations at Lindisfarne. In the north-western corner of the area we’re digging, we’ve identified a square patch of what we’ve half-jokingly been calling ‘Anglo-Saxon concrete’. It’s made of tightly packed gravel, limestone, mortar and daub, with a few big blocks of stone around the edge. Anyone who spent any time digging it can tell you, that though it might not be up to Roman standards, this stuff is pretty tough, and easily withstand the full force of a mattock, even after being in the ground for a millennium. We’ve taken a sample of it so that we can assess exactly what it was made of, and how strong it is (you can follow the progress of this sample through our lab here). But what we want to know right now is was it for, and how do we even know it’s Anglo-Saxon? 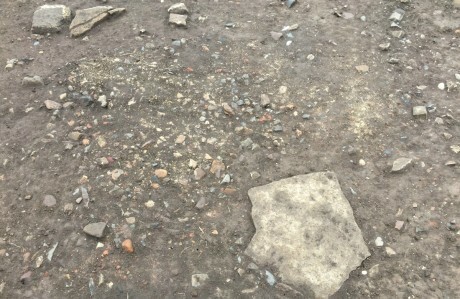 This kind of stone-mortar-gravel concoction was actually a pretty common Anglo-Saxon building material used for two main purposes: to repair or prolong the life of an earthfast building (structures that were originally built straight onto the ground with timber posts and no foundations), or to create a base for the construction of a brand new building. 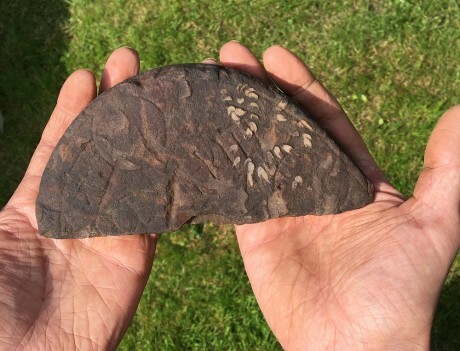 We know this because archaeologists have found this ‘Anglo-Saxon concrete’ at other 8th century sites like Hartepool, Whithorn and Whitby. At all of them, they’ve found this mortar being used to shore up existing wooden buildings, as well as prepare the way for newer, more heavy-duty buildings. At Hartlepool, archaeologists found nine of them, five of which were too closely aligned to a previous earthfast building, suggesting their placement must have been selective. The remaining four structures were not related to any previous foundations and hence represented the adoption of an entirely new building technique. This all begs the question: does the patch of ‘Anglo-Saxon concrete’ we’ve got at Lindisfarne represent an early, wooden building that has been repaired, or a slightly later ‘newbuild’? So far, we have one strong clue: an absence of post-holes suggests there was no previous wooden building, and this marks the construction of a new building. On top of that, it’s location gives us another clue. It is aligned with two later medieval churches, the parish church of St Mary and the Priory church, to the west. But these churches mark the presence of two earlier Anglo-Saxon churches. Could this be the remains of a third Anglo-Saxon church?